We value your feedback! Please send any comments, problems and suggestions to the IDEA Team. GOES-13 has been replaced by GOES-16. GASP is not available on IDEA any more. The images from GOES-16 can be viewed on AerosolWatch. IDEA (Infusing satellite Data into Environmental air quality Applications) is a NASA- EPA-NOAA partnership to improve air quality assessment, management, and prediction by infusing (NASA) satellite measurements into (EPA, NOAA) analyses for public benefit. 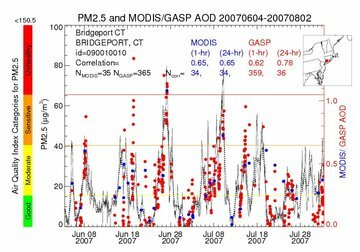 In the Summer of 2003, researchers form NASA, EPA, NOAA and academics prototyped the fusion, analysis and visualization of NASA ESE and US EPA data as AIRNow PM2.5 Forecast Tools. After a successful demonstration, EPA and NASA transferred IDEA to the Cooperative Institute for Meteorology and Satellite Studies (CIMSS), a joint University of Wisconsin (UofW)-NASA-NOAA, through the support of EPA and NASA continued to the operation of IDEA until 2007. In 2007 IDEA was transferred to the University of Maryland Baltimore County and eventually to NOAA NESDIS. Since 2008, IDEA has been running at NOAA Center of Satellite Applications and Research (STAR) and has been hosted by its web server. Zhang,H., Kondragunta, S., and Liu,H., 2013: A Tutorial on MODIS and VIIRS Aerosol Products from Direct Broadcast Data on IDEA, VIIRS Aerosol Science and Operational Users Workshop, College Park, MD, Nov 21-22,2013. Suomi National Polar-Orbiting Partnership (NPP) Visible Infrared Imaging Radiometer Suite (VIIRS) Aerosol Products Users Guide, v2.0, April,2013. Zhang, H., Hoff, R.M., Kondragunta, S. 2009: Development of IDEA product for GOES-R aerosol data, Proc SPIE, 7456, 74560O, doi:10.1117/12.828095, Aug 2-6, 2009, San Diego, CA. Zhang, H., Hoff, R.M., Engel-Cox, J.A. 2009: The relation between Moderate Resolution Imaging Spectroradiometer (MODIS) aerosol optical depth and PM2.5 over the United States: a geographical comparison by EPA regions, J.Air & Waste Manage. Assoc., 59, 1358-1369. Hoff,R., Zhang,H., Jordan,N., Prados,A., Engel-Cox,J., Huff,A., Weber,S., Zell,E., Kondragunta,S., Szykman,J., Johns,B., Dimmick,F., Wimmers,A., Al-Saadi,J., Kittaka,C., 2009: Application of the Three-Dimensional Air Quality System (3D-AQS) to Western U.S. Air Quality: IDEA, Smog Blog, Smog Stories, AirQuest, and the Remote Sensing Information Gateway, J.Air & Waste Manage. Assoc., 59, 980-989. Al-Saadi, J., J. Szykman, R. B. Pierce, C. Kittaka, D. Neil, D. A. Chu, L. Remer, L. Gumley, E. Prins, L.Weinstock, C. MacDonald, R. Wayland, F. Dimmick and J. Fishman, 2005. Improving National Air Quality Forecasts with Satellite Aerosol Observations. Bull. Am. Met. Soc. 86, 1249-1261. Doreen Neil, James J. Szykman, Jack Fishman, R. Bradley Pierce, Jassim A. Al-Saadi, Chieko Kittaka, A good IDEA (Infusing satellite Data into Environmental Applications), American Meteorological Society, 13the Conference on Satellite Meteorology, Society, Norfolk, VA Sept. 21, 2004. Fishman, Jack, James J. Szykman, Chieko Kittaka, R. Bradley Pierce, Jassim Al-Saadi, Doreen O. Neil, John White, D. Allen Chu, and Lorraine A. Remer, MODIS Satellite Observations in "Near Real Time" to Improve Forecasts of Fine Particulate Matter (PM2.5) in the United States. European Space Agency Atmospheric Chemistry Applications Workshop, Noordwijk, Netherlands (ESTEC), 21-22 January 2004. Szykman, J.; White, J.; Pierce, B.; Al-Saadi, J.; Neil, D.; Kittaka, C.; Chu, A.; Remer, L.; Gumley, L., and Prins, E.. Utilizing MODIS satellite observations in near-real-time to improve AIRNow next day forecast of fine particulate matter, PM2.5. Conference on Atmospheric Chemistry, 6th: Air Quality in Megacities, Seattle, WA, 11-15 January 2004 (preprints). Boston, MA, American Meteorological Society, 2004, Paper 1.2. Reprint #3630. Kittaka, C.; Szykman, J.; Pierce, B.; Al-Saadi, J.; Neil, D.; Chu, A.; Remer, L.; Prins, E., and Holdzkom, J.. Utilizing MODIS satellite observations to monitor and analyze fine particulate matter, PM2.5, transport event. Conference on Atmospheric Chemistry, 6th: Air Quality in Megacities, Seattle, WA, 11-15 January 2004 (preprints). Boston, MA, American Meteorological Society, 2004, Paper 1.3. Reprint #3631. We would like to thank MODIS Science Team and LARC DAAC. The project is funded by NOAA NESDIS GOES-R program. We are grateful to STAR's support of IDEA with computing resources and website hosting. We would like to thank Liam Gumley at CIMSS and Scott Macfarlane at University of Alaska for providing near real-time VIIRS data.